They’re probably 3 Watt chips, considering there are four of them and they claim 900 lm, which gives a modest 75 lm/W for the chips. If all you have is a perfboard underneath, those things are practically dead sooner than you can take your new flashlight outdoors to test it. It’s truly disappointing how many people assume that because LEDs are so much more efficient than filament bulbs, that they will run cool. 3 or 5 watts on something the size of a postage stamp (or even less) is still going to be really really hot. The problem is that all the heat is being emitted from a tiny point connection at the LED junction, which cannot heat up beyond 150 degrees celsius, or it’ll destroy itself pretty much immediately. The thermal resistance from that point to the chip casing is significant, which is why the outer casing of a LED chip should be cool enough that you can barely feel the warmth with your finger. If it’s noticeably hot, the LED junction will be 100 degrees hotter. Those are 18650 battery cells and chargers for them are easy to find. MCP73831 and a mini USB socket would be the simplest/cheapest way to charge those cells in-situ. About $2 in parts for a safe, dedicated 500mA charger. I would try and find a protection circuit for it, perhaps salvage one from a dead cell phone battery. It wouldn’t hurt to use thermal fuse from the laptop battery in series too. there are lots of comercialy avalable chargers. most are spring loaded and can go from 17670 down to 14250.
great work in sustaining energy resources!! most people would dump the whole battery pack in garbage if one or two cells where damaged. regarding recharging these cells, well a very important property of li-ion cells is that they need a clean DC input equal to the battery rating unlike other types of rechargable batteries. for examples if these cells are from a laptop battery pack then most probably they are 4.2v cells and require exactly 4.2 v input to charge them not more not less!! any voltage fluctuation at the input will damage the battries. thats the job of the circuit u find inside your battery pack plus some other functions. Lithium batteries don’t require an exact voltage – they have a maximum voltage. Even so, you can charge the cell to 4.3 volts if you want more capacity with a reduced cycle life. At some point, maybe 4.4 volts or 5.5 volts, you will get a fire. Lithiums are usually charged CC-CV, which means that they are charged at a constant current that depends on the cell size, and when the voltage rises to the maximum value, it is held there until the current drops and the battery is considered full. You also have a minimum rated voltage, usually 2.2 or 2.5 volts and if you go below that voltage the cell breaks down and becomes chemically unstable, which may end up in a fire the next time you recharge it. Usually there’s a small circuit in the battery that blows a fuse if either condition is met, and the battery becomes unusable. This feature of lithium batteries has caused some controversy with electric cars, because, if you leave a Tesla Roadster to sit in a garage for long enough on empty batteries, you’ll have a $75k repair bill waiting for you after the holidays. Just be careful – Using a CC CV scheme is correct, but the current never drops to zero. LiIon/LiPo does not tolerate tricke charge, since this plates metallic copper inside the cell, shorting it out, resulting in thermal runaway, fire, exposion etc. I would not recomment any one charging cells without the correct circuitry to do so. A lm317 won’t cut it. If he put in any kind of external connector (or left visible any pair of wires, really), there’s always the option of radio control hobby chargers. RC-plane batteries don’t carry electronics for obvious reasons. definitely true johannes there’s no need for electronic circuitry.. an tiny cheap voltage regulator can do the job and a charger can do the job, but note that rc planes run on li-polymer batteries not on lithium ion. That’s no 1000 lumens. You need over 10 Watts to produce that much light, and the lamp has little to no cooling to the LED chips, which means they will give full output the first three seconds and then dim considerably, and after a few more seconds they’ll sustain permanent damage. As Dax said, not 1000 Lumens by far, not even China lumens. 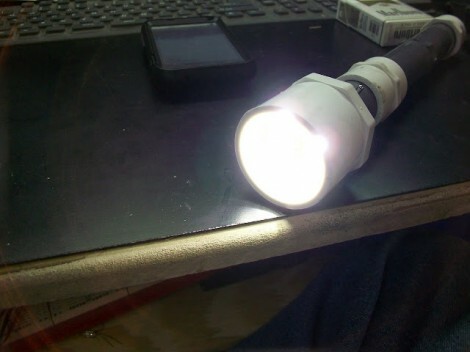 But I like the design (with it’s anti roll feauture), it’s just the wrong material to build a bright flashlight, but on the other hand brightness isn’t always key, so if it’s runtime, why not using plastic tubes. @HAD, those cells are welded together, so no desoldering. It should also b mentioned that playing with any type of lithium battery isn’t without risks, so i suggest doing some research before starting a LiXX based project. Anyone want some cells? I have a few laptop batteries in my basement that could be salvaged by the right person. If you don’t want them let someone you know who does want them. They are free+shipping. I fear incorrectly used lithium cells. To me, this just looks a handheld pipe bomb. I discourage anyone from doing this, it’s just simply not worth the risk. Ghetto-charging them with an appropriate voltage, a thermistor for overheat protection and a timer to keep from excessive overcharging is pretty simple. It’s horrible, I know, but it works. Three cells charged at 13,8v/1A for two hours usually does the trick for my old ones. I use a cheap 18650 charger I picked up somewhere on-line to charge the cells. It was maybe less than 10 bucks. I know that it’s not throwing out that many lumens in this configuration. It’s just the type of LED that was used in the last one. There are resistors in each one to keep them from burning up. I know it’s not the correct set up just was using parts I had on hand. Yes they look a little sketchy so it’s not something I would be carrying around in public. It was more about having little fun with junk parts. So far they all are still working. I use the AD-103 charger. It’s charged everything I’ve thrown at it, from 3.7v 18650 down to 1.2v NiMH AAA cells, I don’t have any LiION 9v cells, but it does those as well. Wow… i bought a couple of that charger just for the battery clamp, i would never actually use the mains voltage circuit from that. The circuit is appalling, there are no considerations for electrical safety, the components are not properly rated and there are no filters what so ever. The whole thing is illegal to import in many countries, and illegal to retail in most countries because of the irresponsible design. Only drawback is that they use low-side current sensing so you cannot have a common ground of your battery and your charger. But again it can be constructed from basic components. C’mon, NOT e-cigarette! the pic shows he’s a REAL MARLBORO MAN! Bantam BC8 charger rigged up to a few 18650 holders from Digikey lets me charge up to 8 at a time.